I’ve been trying to adjust to this ever changing weather this week. It’s been the strangest winter ever. This week one day was 6 C and raining, the next day was -10 C and the following day there was a snow storm. Today it’s very cold still, but it’s supposed to go above freezing tomorrow. I hope this isn’t a bad cosmic sign or something. I finished the first slipper of the Moc-a-Sock Slipper last week and I’m at the bottom of the first cuff of the second slipper. It’s a cool pattern, but a bit too fussy to make while watching TV which has been frustrating for me since that is my prime time for knitting. 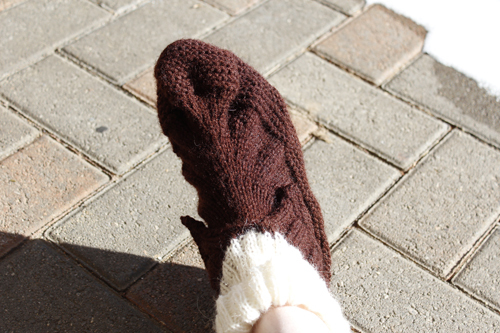 Here’s the first slipper – photographed outside in -10 C weather because I wanted to take advantage of the glorious sunlight that was present this morning.